After the announcement of the first HODL mining pool there was a centralization of most of the network hashrate in that pool as many people moved away from solo mining. Now we have a second HOdlcoin mining pool from Suprnova available, so you can move your hashrate there in order to balance out the hashrate distribution among the two pools and with the solo miners things should be safer for the HODL network. Of course having a few more pools won’t hurt either, but even with two mining pools things are significantly better than with just one, so this is definitely a move in the right direction. In order to mine HODL with the new Suprnova pool you can use the same dedicated hodlminer CPU miner (source) available for download below in the form of a Windows binary. If this is the first time you are hearing about HOdlcoin (HODL) you might want to get to know about the altcoin a bit more as it has an interesting idea and bonuses for early adopters. Also the new Suprnova pool has a fee of just 1% as compared to the fee of 2% for the Blockquarry Hodl Pool, so this can also be a reason enough for some miners to switch and try the new pool. Do note that the Suprnova HODL pool was just launched, so there might be some things that need to be fixed, though it seems that the mining part is working just fine already. We have recently covered HOdlcoin (HODL) as an interesting new altcoin. For the moment HODL is only CPU mineable and you could only mine it solo with the wallet, but the first mining pool is now available with a dedicated hodlminer CPU miner (source). 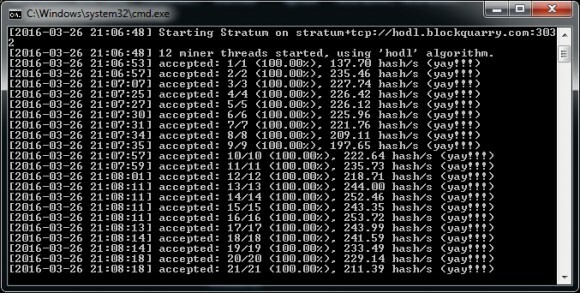 The miner supports Stratum and you can control how many CPU cores you want to utilize to mine HODL, however at this point it does seem to be slower than the built in CPU ‌mining in the wallet. With hodlminer we are getting just about 1/4th of the hashrate we get in the wallet or just about 45-50 H/s as compared to about 200 Hashes per second in the wallet (under Windows 7) using an Intel Core i7 5820K CPU (6 cores – 12 threads). So you might want to wait for a more optimized miner to become available and keep solo mining for the moment in order to have higher hashrate available. Using pool mining does provide lower rewards per block, but also should ensure stable and more predictable mining income, unlike when solo mining at this already pretty high difficulty where luck plays a lot of role in how much you will make. Update: New faster version of the miner is now available that should provide slightly higher hashrate than what you are getting using the wallet miner, increase should be something like 10-20% or more, but it can vary, so you need to test and compare. Just download the updated binary and try on your CPU and feel free to post result in the comments below.